Dorset Fencing Supplies Ltd are now stockists of CLIPEX Galvanised fence posts. Providing a practical and financially viable alternative to timber fence posts. The Y shaped profile of these posts makes them very strong but easily manageable, much lighter than equivalent timber posts. When used in conjunction with our Reclaimed Telegraph pole strainer you will have a secure permanent fence which also has the added benefit of being re-usable if required at a later date. ECO Post. Introductory level economy post 1.8mt long. Made from 2.5mm high tensile steel. Suitable for permanent or temporary electric plain wire and stock fence. STANDARD Post. Same dimensions as the ECO post but made from thicker 3.00mm High tensile steel. Suitable for Permanent electric fencing and stock fence. BEEFY Post. As the name suggests this is the heavy duty option 2.0mt long. For use in areas of maximum resistance. For example changes of direction, soft ground or hollows. Or simply where you need a more formidable barrier. These versatile posts can be used with 800mm high stock fence and two lines of plain or barbed wire. Or 900mm high stock fence with one line of wire above. Alternatively they can be used with lines of plain or barbed wire. 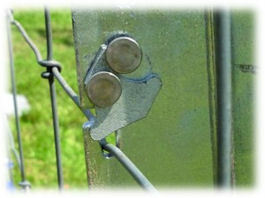 Simply click the wire into the retaining slots which are at fixed distances on the post. Due to the tensile strength of the post they have a good degree of flex so if an animal, tree or machine push against it the post will flex, then return to upright once pressure is removed. The CLIPEX posts are easily installed either using a hand post rammer, maul, conventional post driver, or a 4 stroke hand held post driver weighing only 14.5kg. Simply slide a tubular sleeve over the post to prevent damage to the galvanising. The retaining pins which hold the wire in place sit flush with the edge of the post so do not interfere with any installation method. Please phone our office 01929 459083 for more details and a competitive price.